The Ninja Turtles have always had their share of cosmic adventures, dating back to the original books Kevin Eastman and Peter Laird did. It’s as much a part of their mythology as anything else. That being said, I’ve always preferred my TMNT stories to be more on the Frank Miller side of things. I like my Turtles to be stealthy, rooftop hopping shadow dwellers, as opposed to laser dodging, spaceship flying, alien-fighting adventurers. But even if you come in with that mind set, Krang War is a pretty good Ninja Turtles story. 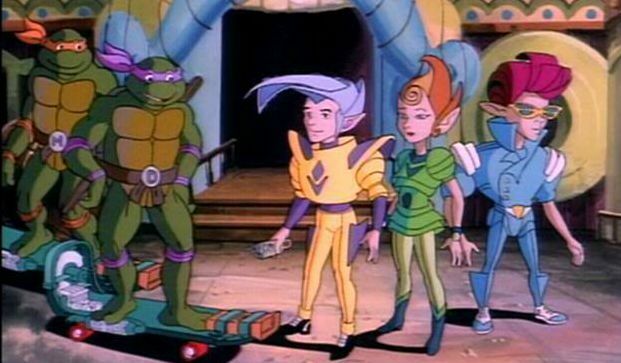 When the Turtles, April O’Neil and Casey Jones decide to investigate Stockgen further, they shockingly discover that April’s former co-worker Chet is actually the Fugitoid, a robot from Dimension X. Fugitoid contains the consciousness of Honeycutt, a scientist who once warned the high council of the planet Utrominon of their world’s imminent destruction due to their overuse of one of it’s natural resources. But the council refused to heed his warning, and the planet was doomed. Thus, the Utrom warlord Krang is determined to manipulate Earth’s atmosphere to make it a new Utrominon. In the meantime, Krang’s forces have invaded the planet Neutrino. When forces from Neutrino come to Earth and retrieve Chet/Fugitoid/Honeycutt to help them build a weapon, the Turtles are drawn into their war. But how does all this, and the ensuing battle, involve the Shredder’s daughter Karai? I have very little complaining to do about how well Waltz and his various collaborators have brought elements from the original cartoon show into the modern era for this series. Krang War is no exception. Children of the ’80s will recognize the Neutrinos, Kala, Zak and Dask. King Zenter and Queen Gizzla are also there, though in name only. Eastman, Waltz and Bates do a fine job of re-interpreting them for a universe that’s a bit more mature (though not too mature of course). The high-registered, lingo spewing teenagers driving souped up flying cars, replaced with battle-hardened soldiers with familiar hairdos. Krang’s rock soldiers from Dimension X look good too. Ben Bates’ art is a definite improvement over Andy Kuhn’s in the last volume. Kuhn’s art is fine in it’s own right, but Bates is a much better fit for the Ninja Turtles. He does a great job giving us the cartoony expressions and humor, in addition to the more serious drama and action. In a way it’s a meld of a lot of the great TMNT incarnations through the years. I can see Eastman and Laird, the 4Kids animated series, as well as traces of the current animated series. He brings the pencilling back up to the level it was when Dan Duncan was on the book. Sadly, this book contains his entire four-issue run. I liked the way Karai was worked into this story. Although, there was a weird scene between she and the Shredder in issue #19 where they’re sitting at a table eating while they’re in full combat gear. But on the whole, her presence in the story was a nice way to keep the Foot Clan involved in the proceedings without actually making the story about them. By the time we close the book, we also have something that could finally prompt a meeting between Shredder and Krang. I don’t necessarily see that happening until autumn at the soonest. But I’m guessing it’s in the near future. IDW’s Ninja Turtles series has had a fairly hit-or-miss existence. They didn’t pay off Raphael’s early separation from his brothers in the first book, and things took a tumble in the third book with the team’s first confrontation with the Shredder. But things have gradually been on the uprise since then. In truth, this is the best the series has been so far. Perhaps it’s a matter of Eastman, Waltz and the creative team finally getting comfortable in their skin as far as this new continuity is concerned. Either way, my hopes aren’t high that things will stay this good. But after 20 issues, at least our creators have a little more experience on their side. Image 1 from teenagemutantninjaturtles.com. Image 2 from 4thletter.net. This entry was posted in Comic Books/Graphic Novels and tagged Ben Bates, Donatello (TMNT), Fugitoid, IDW Publishing, Karai, Kevin Eastman, Krang, Leonardo (TMNT), Michelangelo (TMNT), Ninja Turtles, Raphael (TMNT), Teenage Mutant Ninja Turtles, Teenage Mutant Ninja Turtles (IDW), Teenage Mutant Ninja Turtles Vol. 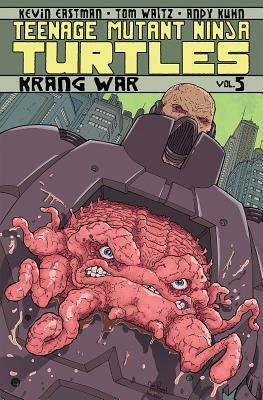 5: Krang War, The Neutrinos (TMNT), The Shredder, TMNT, Tom Waltz, trade paperback, trade paperback reviews on 05/05/2013 by primaryignition.